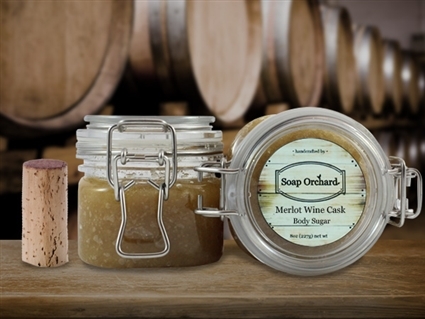 Merlot Wine Cask Body Sugar is made with Grapeseed Oil which is extracted from wine grapes and is high in Vitamin E. The sugar exfoliation is enhanced by the addition of Orange Peel. Wonderful! Saccharum officinarum (PureCane) Sugar, Carthamus tinctorius (Safflower) Oil, Silica, Polysorbate 80, Prunus Amygdalus dulcis (Sweet Almond) Oil, Simmondensia chinensis (Jojoba) Oil, Vinis vinefera (Grape) Oil, Tocopherol Acetate (Vitamin E), Retinyl Palmitate (Vitamin A), Wine Fragrance Oil Blend, Citrus Aurantium (Orange) Essential Oil & Peel, Fragaria ananassa (Strawberry) seed and Rosmarinus Officinalis (Rosemary) Extract.